Owners Lenfesty, Paysse & Murphy. Images by Ethan John. Holy Mountain Brewing is set to have their official launch event at The Pine Box tomorrow, October, 14, starting at 6pm. If you missed my piece on these guys back in June, check it out now. There is much to be excited about. In the past few months, they’ve been hard at work putting together their brewhouse and taproom. They went live just about a month ago, brewing their first batch in early September. Many breweries would have rushed to get as much beer to market as soon as possible, but Holy Mountain concentrated on filling barrels for future rewards. That includes getting their sour base going in multiple barrels, and filling others with imperial stout and a double oatmeal brown ale. These guys aren’t screwing around. The first beer released to market was their Equinox Fresh Hop, which has been around the past week at some of the city’s better beer bars. The guys from Holy Mountain will be bringing that beer to The Pine Box tomorrow, along with The Seer Hoppy Saison, King’s Head Double Oat Brown and a Gose. Cheers to Colin, Adam and Mike for making their dream a reality. I can’t wait to see what the future holds. 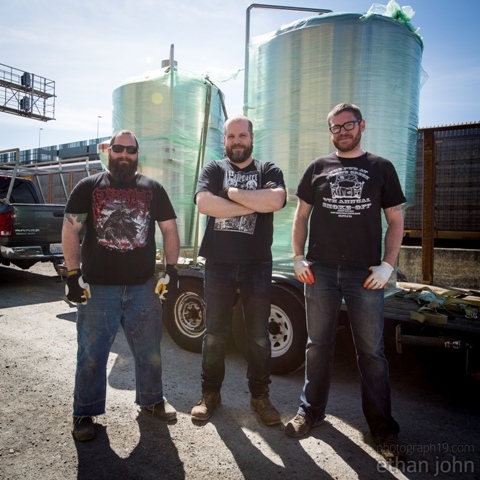 (Seattle, WA) More than four years in the works, the first barrels have been filled at Holy Mountain Brewing Company, located in Seattle’s Interbay neighborhood. Focusing on hop forward, barrel aged, and yeast driven ales and lagers, Holy Mountain will launch its first beers into the Seattle market in early October. In 2010 head brewer Colin Lenfesty and president Adam Paysse, both award winning homebrewers, rented an industrial space in SODO to expand their brewing efforts and prepare to open a commercial brewery. Lenfesty spent his days brewing professionally, and the two spent nights brewing pilot batches. Holy Mountain was born when the pair met Mike Murphy, whom Lenfesty knew from his day job, where Murphy ran the brewery’s sales operations. “We saw all these other breweries popping up, but we were really intent on having everything dialed in, so we just tried to stay patient,” said Paysse. “Once we decided to do Holy Mountain we spent the better part of two years running trial batches with saison and brett strains and dialing in our water chemistry, all while writing and rewriting a business plan.” The three hope that their extensive brewing experience and dedication to quality will set Holy Mountain apart. Drawing inspiration from both yeast driven continental beers as well as hop forward West Coast ales, Holy Mountain will focus on brewing seasonal releases, with the inclusion of barrel fermented beers, and the intent to create a prominent barrel aging program. Holy Mountain will produce beer in 20bbl batches, and will not feature a fixed flagship beer. The initial lineup will include The Seer – a hoppy farmhouse ale, The Goat – a rustic barrel fermented farmhouse ale, King’s Head – a double brown ale brewed with a generous portion of oats, and an aromatic fresh hop American Pale Ale hopped entirely with the new Equinox varietal, harvested on the autumnal equinox and used to brew the same day. Construction is also underway at the brewery’s 1421 Elliott Ave W location on a 60 seat taproom. Designed and built largely by the three founders, Holy Mountain’s taproom will be open and spacious, with high ceilings and a large bay door opening onto the train tracks and Pier 90.